It's like 2012 all over again. Sen. Elizabeth Warren's speech at Bedford High School felt like a roast, not on Donald Trump, but on her former rival former Sen. Scott Brown. "I'm here to apologize, back when I beat Scott Brown in 2012, I never expected him to pack up his truck and move to NH and become your problem," said Sen. Warren. Speculation is that Warren could be Hillary Clinton's pick for vice president and Senator Brown has been a rumored potential Trump running mate for months. "When I heard Donald Trump was floating Scott Brown as a potential running mate, I thought ohhhh Donald Trump really does have a plan to help the unemployed," said Sen. Warren. 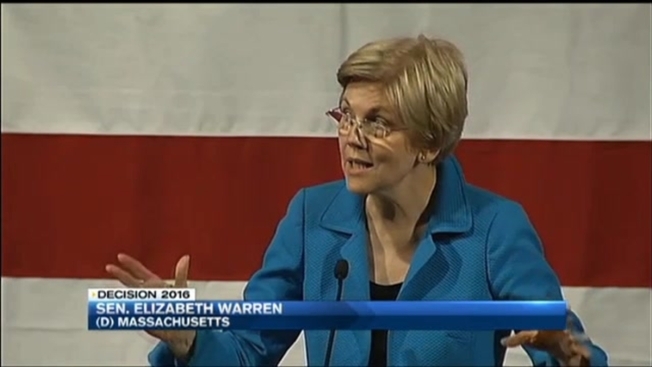 At the New Hampshire Democratic Party Convention, Warren took shot after shot at Brown. "Let's face it, no one knows more about losing to a woman than Scott Brown," she said. "Think of it as the perfect reality show, Celebrity Apprentice meets The Biggest Loser." Sen. Brown is in Washington, D.C., but he told necn over the phone he doesn't understand the attacks. "I find her obsession with me starting to get a little weird, every time she speaks she seems to bring me in somehow last I heard, we aren't running against each other." With a little humor, both say they're hoping the other makes it onto the ticket. "Scott Brown for vice president makes sense, I mean that, I think of all the expert advice he could offer... Making up lies about me and my family, saying weird stuff about his beautiful daughter," said Sen. Warren. Sen. Brown also made a jab. "I hope Hillary picks her because Hillary will not only have to answer about her failings in Benghazi but also her checking of the box or representing big corporations against the little guy basically it's going to be fun to watch," he said. Brown says he won't comment on his place in Trump's campaign. Warren has also not commented.